Description: Both of the roads working the Tier are represented here; NS 9361 leads local H 85, working the Gang Mills yard, as CP 167 behind SD40-2 6018 rolls past with 63 cars bound for Toronto. Description: CP 167 rolls west behind an Action Red unit, with three dual flags behind, all for 63 cars. 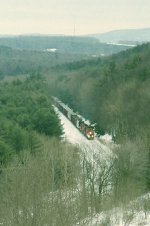 Description: CP 167 rolls along the Chemung River valley in this view from adjacent NY 427. Description: A trio of SDs has 40 cars of 252 coming out of the tunnel, now on the downhill ride for the last 15 miles into Binghamton. Description: Train 252 rolls up to the tunnel, about to enter the north portal. Description: CP Train #661, the CP 5950 West rolls through Wauwatosa, WI. Description: This CP dash 2 is seen trailing the 8529 on the pass at Humboldt Yard. Description: CP 8529 is waiting on the pass at Humboldt before heading to St. Paul. Description: All of the CP SD40-2's I saw today were Dual Flags, a nice change. Description: Last 2 of 8 units. Description: Now this was a great find. I am guessing the EMD's were off line. I was so busy shooting I couldnt tell what ones were running, plus they were coasting down hill into Enderlin. Description: A line of CP EMDs waits to be moved to Progess Rail to be rebuilt or scrapped. One of the Expressway units leads the line.